1. iPad Apps. There are so many. Whenever someone asks me for app recommendations, I often turn to my “go-to’s” without doing much more hunting. In a workshop about using tablets in the classroom, I learned so much about app integration for both content (student learning) and creation (student making). For example, AppFusion or App Smashing is the process of using several apps to create different parts of a project, and then using one app to pull all the parts together. One such “fusion” app is ThinkLink, which can incorporate sound, video, images and text to create a short presentation, much like a PowerPoint or Prezi. Learning about all of these different apps stressed our responsibility in higher education to be knowledgeable about a variety of apps for different functions, such as video creation, white board drawing, or photo editing. A grid with apps, their functions, preferred platforms, etc. 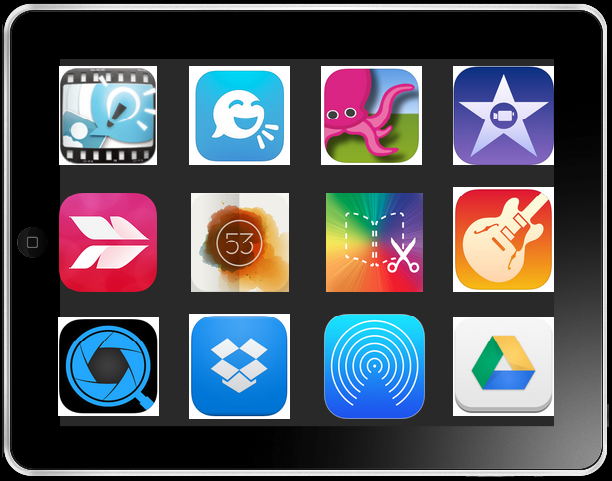 is a simple tool that we can develop to help students and faculty choose the right apps to use in the classroom, especially as we prepare new iPads for our lending program this fall. “Deeper learning.” Learning in the classroom is great, but if it can’t be applied to real-life situations, it may not stick for all students. Presenters Chris Dede of Harvard and Julie Evans of Project Tomorrow explained that “deeper learning” involves this connection between learning and life, and also spoke about essential strategies for mobile learning, stemming from their 2014 Qualcomm report, The 8 Essentials for Mobile Learning Success in Education. One of the highlights included a video of an augmented reality project where students interacted with hotspots on their mobile devices when out studying a pond in order to reinforce ecological concepts. 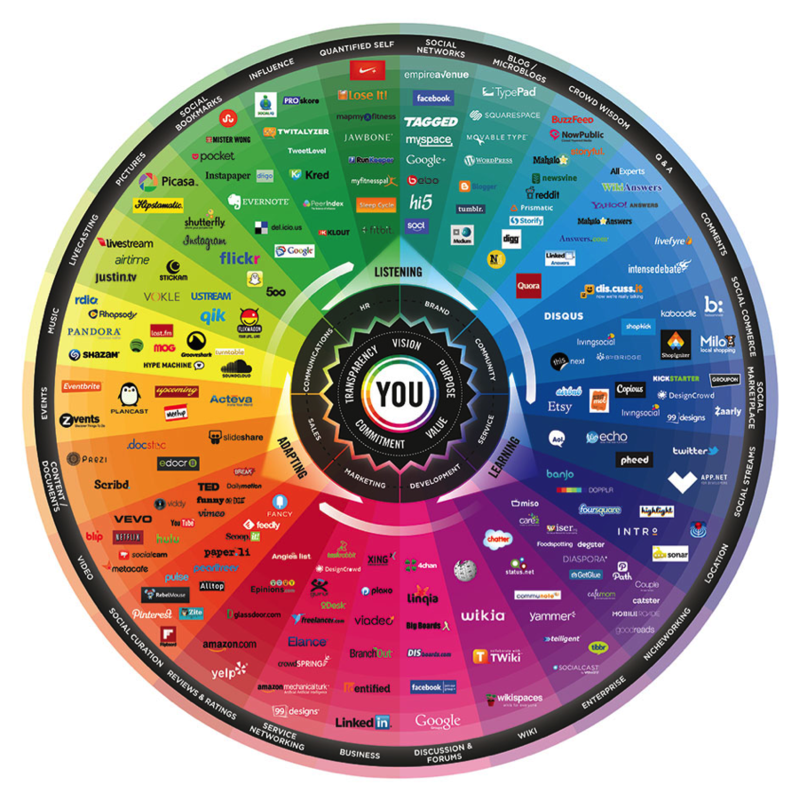 The presenters also stressed the importance of how students use social media platforms to think together and share information, and offered a great resource called the Conversation Prism. One point that stuck with me in terms of working with students and faculty at Penn involved developing fluency in interactive media. Chris Dede made the point that often, we have to create communities of “unlearning” the more traditional methods we’re used to, in order to become fluent in various media and collaborative, inquiry-based learning strategies. This is a tall measure for folks in higher-ed, but nevertheless something I believe we should all be striving toward. Backchannels. A backchannel is a second form of communication that takes place at the same time as a face-to-face session, whether it’s a lecture, conference session, or other learning activity. In a great session on backchannels, where we modeled this behavior during the presentation, a high school teacher and college professor explained how they use backchannels, why they’re useful in the classroom, and shared a variety of different channels to consider. In one class, students used a backchannel while watching a video in order to answer certain questions about content and also ask questions of the teacher and other students. Backchannels, which include popular options like Twitter (using a class hashtag, for example), Today’s Meet, and Backchannelchat.com, can be a great way of getting students who usually don’t participate to join the conversation. In a “fishbowl” scenario, students on the outer edge of the class can be using the backchannel, while those on the inner circle can be paying attention real-time, and then roles reverse halfway through class. On certain platforms, students can remain anonymous to each other on a backchannel, but the instructor knows who’s chatting and can do some formative assessment. Some other backchannel platforms include Piazza, Tozzl, and Socrative. We often get questions from faculty about backchannels here at WIC, and this presentation made me feel more prepared to recommend different tools and discuss the pros and cons of using backchannels in teaching and learning. Other great resources I learned about at ISTE included those about digital and media literacy, such as Common Sense Media’s digital citizenship curriculum, and how to teach and implement digital literacy using strategies from the Center for Media Literacy. I learned so much from K-12 educators at the ISTE conference. I now have some new goals and much personal learning to do as we prepare for the fall semester! Join us for our SAS Major Dinner tomorrow, February 19, 6:30 pm in the WIC Seminar Room. RSVP now! 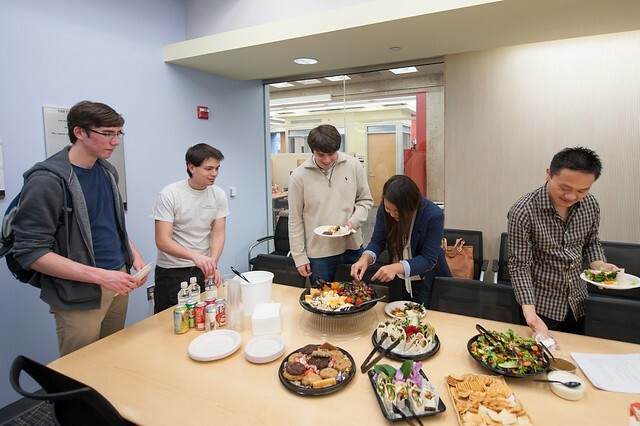 Come join staff and students for an informal dinner and discussion of the academic support and technology resources available at the Weigle Information Commons. We will discuss the Seltzer Family Digital Media Awards and the Hoesley Digital Literacy Fellows Program. Bring your questions! Last Tuesday was the much-anticipated PhillyDH@Penn event, inspired by the recently formed PhillyDH group and held in the new Special Collections Center. For me, the event was a wonderful way to round out my almost-one-year anniversary of starting my WIC internship. Last summer, I tried to articulate what DH is (or rather, how difficult this is to articulate) via my brief DH encounters in graduate school. From there, I’ve spent the year reading articles, attending events, writing blog posts, and playing with new tech tools, all of which has given me a much better sense of DH scholarship. So many takeaways emerged from Tuesday’s unconference sessions and workshops that I could create a laundry list (or, more appropriately, an interactive word map). Instead, I’ll share my favorite takeaways that helped me better understand my role in DH as a WIC intern and librarian-in-training. 1) Don’t force the DH. Undertaking new digital projects is by no means an easy task for anyone, let alone time-crunched college professors and students. Before you think about incorporating DH into your classroom, think about what your goals are for your students and what you would like students to do at the end of the course. Once you figure this out, find out whether there are any digital tools that would enable or enhance students’ learning experiences. From what educators discussed at this topic’s unconference session, this approach has proven more productive than building a class around a specific digital platform. 2) Use your libraries (and librarians)! Because people have little time to learn new technologies, the library can provide a significant training grounds to teach and learn digital tools. Today’s librarians have become more “blended” not only in teaching research skills but also instructional technologies; further, the library is a neutral space on campus or in the community where everyone can come to learn. It was refreshing to hear this message from librarians, educators, and information professionals alike. It also allowed me to realize how our WICshops and special WIC programs help to meet this digital teaching/learning need. 3) Metadata is your friend. I don’t know very much about metadata, but I do know that it has great potential to change the ways people search for and find various materials. Folks from the Penn Libraries spoke about the Penn Provenance Project on Flickr, which started out as a rare book cataloging endeavor and has now captured the attention of those all over the world as they recognize books’ signatures, titles, and authors. By tagging the Flickr photos, patrons help create the metadata that link these images to Penn’s library catalog, Library of Congress records, and even Wikipedia, making information more easily accessible and retrievable for all involved. 4) Social media can be overwhelming. But, making comparisons can help! We’re always looking for the newest social media tools to use here at WIC, but I haven’t really taken the time to see which ones are most effective for which tasks. Browsing lots of graphics, online materials, and “about” sections of social media websites helped me to create a social media comparison chart to sort out all of this. I hope this information will be helpful for both our WIC staff and for all those trying to make sense out of multiple social media accounts. These are just a few ideas I took away from PhillyDH@Penn. The event initiated so many productive conversations among folks across the humanities in universities, libraries, museums, and archives (workshop materials and unconference notes are now online). I can’t speak for everyone, but I know that I came out of the day with the challenge to not only think about new models of teaching and learning with digital tools, but also to keep up the conversation with colleagues in the Philly area and beyond, as collaboration in DH is key to getting successful projects off the ground. Join us for PhillyDH@Penn – only 25 spots left! Inspired by the success of last year’s THATCamp@Penn, along with the great energy from the newly-formed PhillyDH group, a group of folks doing DH* work decided to get together to plan an event that will bring together interested parties from across the Delaware Valley (and beyond – we have registrants from as far away as Buffalo, NY!). The day is going to be jam-packed with both formal and informal learning opportunities. It will also be one of the first big events in the brand new Special Collections Center on the sixth floor of Van Pelt, and we couldn’t be more thrilled to show off our new space. Sign up NOW to reserve your spot, and join us on the sixth floor on June 4th! *DH stands for “Digital Humanities.” Want to learn more about DH? Check out our blog posts on the topic! Want to learn more about what WIC can do for you? Join us for our SAS Major Dinner next Monday from 5:00 to 6:30. Check out our flyer below for more details! RSVP at https://fission.sas.upenn.edu/survey/878. Next Wednesday, November 14, the ALA Digital Literary Task Force program is hosting a nationwide virtual conversation called “Creating a Culture of Learning: How Librarians Keep Up with Digital Media and Technology.” The Google Hangout session will explore how information professionals can keep pace with students, faculty, and library patrons as new technologies and devices emerge. WIC’s Director Anu Vedantham will be speaking about integrating technology into teaching and learning and offering suggestions on how to stay up-to-date. The District Dispatch blog includes a recent article on the event. You can register online to watch the conversation on Youtube, or follow the conversation on Twitter with hash tag #digilit12. We are looking forward to this exciting event!